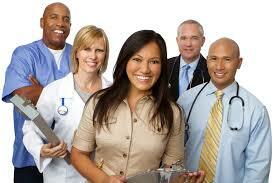 As patients at doctors' offices and hospitals we're familiar with interacting with doctors and nurses. They are the faces and professionals who directly interact with us, giving us the care, advice, and medication we need to feel healthy and happy. But who is it that runs these offices and hospitals? How do the doctors and nurses we see actually assigned to us, and what policies and methodologies do they abide by? There are many more questions we could ask too, but the basic sum of these trickles down to the fact that behind these medical professionals stands a long line of administrators and workers who produce the organization and environment that allows patients to receive the care they need. Healthcare organizations in many ways are similar to businesses, and have similar needs, such as Supplies, Billing, Accounts Payable, Credentialing, Transportation, and Marketing. And on beyond all of these is the need for effective administrators to make sure doctors can keep serving patients. If you're interested in the healthcare field and have a gift for working behind the scenes to make sure everything is functioning efficiently, then obtaining your Associate's Degree in healthcare services administration is the right move for you. The many tasks of healthcare administrators can be broken down into two broad categories to manage and to adapt. A healthcare administrator might be in charge of an entire medical facility, or they might have responsibility over one particular department in such a facility. The other portion of their responsibilities adapting, comes as a result of the constantly changing laws, technologies, and insurance provisions in the medical field. The best healthcare administrators, no matter where they work, will make sure that the doctors and patients have what they need to maintain health in an equipped, ethical, and caring environment. More specifically, a healthcare administrator's typical responsibilities include staying up to date on their facility's compliance with laws and regulations, supervising staff including other administrators, manage the finances, keep organized records of patients and personnel, communicate changes and important information to all appropriate members, and make sure all departments are fulfilling their own responsibilities. A healthcare administrator might work in one particular department of a health organization, such as a billing, accounting, marketing, or human resources department. The types of facilities that require healthcare administrations are hospitals, doctors' offices and medical groups, nursing homes, and treatment and therapy centers. Job opportunities in each of these facilities are expected to grow over the next decade as the Affordable Care Act is enacted and as such institutions are predicted to grow larger and more complex. With larger governmental influence and with a higher degree of complexity, more organizational leadership is required to make sure everything the facility needs is provided for. An Associate's Degree for healthcare services administration focuses on an array of courses that intertwine your understanding of both the medical and the business field. Courses include administration, leadership, ethics, healthcare laws, and other similar studies. You will be prepared to find positions that put the power of organization in your hands, making sure that the staff and the patients are fully satisfied with the way everything in the healthcare facility is running. So often we forget that behind the friendly faces of the doctors and nurses we see is an entire staff of talented healthcare administrative professionals who are making sure you have what you need as a patient to stay healthy. No matter kind of medical facility it is, strong organizational skills, leadership, and knowledge of the complex world of medical care are necessary. An Associate's Degree in healthcare services administration provides you with this essential information, and equips you to earn an exciting career in a field that is constantly changing, challenging, and satisfying. During your Associates degree program you’ll gain experience in things such as medical coding, billing and even medical transcription. Most colleges offer a 2 year program however we have seen a few schools that offer 15-18 month Associate degrees. Be sure to check what is required to graduate if in fact the program is under 24 months. Often the school allows you to take some of the courses online as well as at your own pace however often this requires you to be a full-time student and would be very difficult if you are working while going to school. Most of the careers you’ll find when you first start off will be in medical records or front office administration. These entry level jobs are a great way for you to learn more about the industry while still employed in the healthcare industry. Other positions not to overlook would be as a physician’s assistant, an EMS or EMS manager.